Each year, the “residents” of McMurdo Station, Antarctica, celebrate Christmas by singing and sharing Christmas Carols via HF — using a non-Amateur Radio frequency just above 40 meters — for those at remote Antarctic field camps. They’ll be doing it again in 2017, on Saturday, December 23, at 2300 UTC. 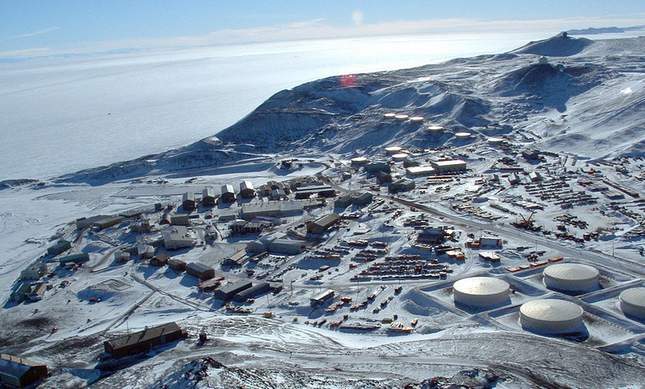 Frissell said McMurdo Station would serve as a net control of sorts to coordinate the various broadcasts, which will include a small choir and vibraphonist John Piper at McMurdo. Other camps and South Pole Station each will have a chance to chime in. The broadcast will take place on December 23 on 7995 kHz USB at 2300 UTC, which will be Christmas Eve in some parts of the world. Frissell requests reports via e-mail. For a Christmas in Antarctica SWL QSL card, send an SASE to his home address. A YouTube recording offers a sample of last year’s transmission. Click here to read this story on the ARRL News page. This entry was posted in News, Shortwave Radio, Specials and tagged Antarctica, McMurdo Station on December 22, 2017 by Thomas. We had a wonderful time singing over the radio from Antarctica this year on 7995 kHz. We heard carols not only from McMurdo Station, but many of the other bases and remote field camps as well. This includes South Pole Station (American), Mario Zuchelli Station (Italian), Siple Dome Station (Italian), Grounding Station (American), Diamond Hills Field Camp (We think!) (American), and Science Event I-196 (American). Sing come through the static for about 30 seconds. This transmission originated from South Pole Station. So far, these reports have come from the Netherlands, Germany, and Australia. A few US stations believe they heard the transmission as well. Many reported using the University of Twente Web SDR. Your e-mail reports made everyone very happy down here. We are all very excited to receive Christmas greetings from around the world! Nathaniel, I’m so happy to hear your signal was heard around the world. I listened, but never heard your carols break through the static; in truth, conditions were less than favorable here. I did make a spectrum recording, and will go back through it again. Here’s wishing you and all of your colleagues and family a very Merry Christmas! This entry was posted in News, Recordings, Shortwave Radio, What's On Shortwave and tagged Antarctica, McMurdo Station, Nathaniel KC4/W2NAF on December 24, 2014 by Thomas. UPDATE: Check out Nathaniel’s message with recordings. Hi, everyone. Merry Christmas, Happy Hanukkah, and any other holidaysyou may celebrate! Things are going well down here (Antarctica), and I’m glad to have worked some of you on the air. I apologize for any weak signals, but there has been a lot of space weather activity recently and the station here is rather modest. Each year, the residents of McMurdo Station, Antarctica celebrate Christmas by singing Christmas Carols to the remote, Antarctic field camps on the HF radio. This year, we are asking ham radio operators (and shortwave listeners) around the world to listen in and e-mail short wave listening reports telling us how far away the carols are heard. Listen on 7995 kHz USB on 24 December 2014 2300z and e-mail reports to w2naf@arrl.net. For a Christmas in Antarctica SWL QSL card, please send an SASE to my Blacksburg address. NATHANIEL A FRISSELL, 1412 North Main Street, Blacksburg, VA 24060 United States Special cards will be made for this event. Please share this information with as many hams and SWLs as possible. It would be really interesting to know how far we are heard. I believe we will be running about 1000 W for this. This entry was posted in News, Shortwave Radio, What's On Shortwave and tagged Antarctica, McMurdo Station, Nathaniel KC4/W2NAF on December 23, 2014 by Thomas.